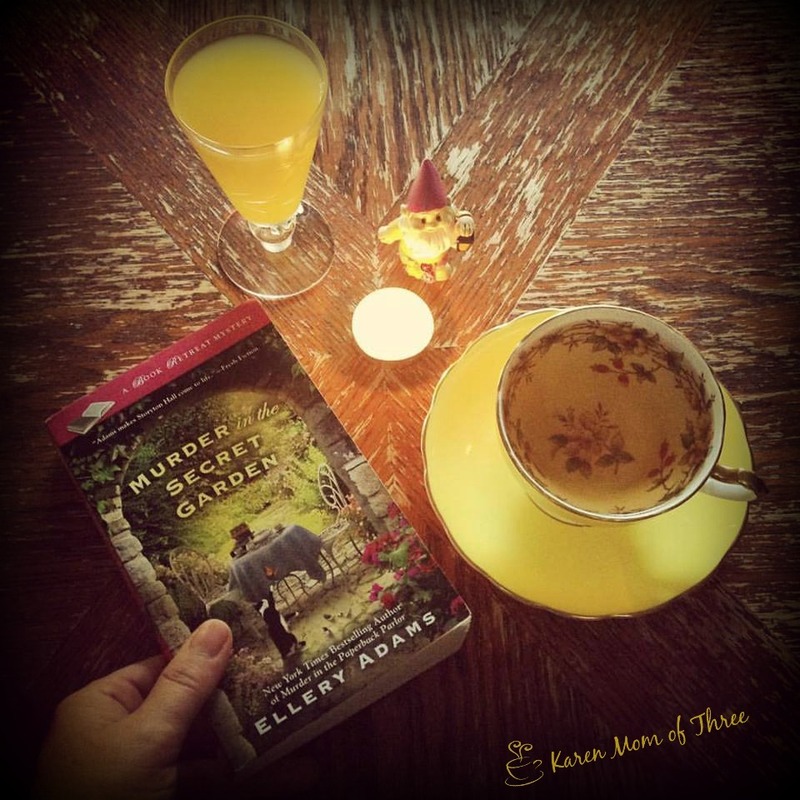 Murder In The Secret Garden, What A Wonderful Read! What I would not give to have a weekend away at Ellery Adams Book Retreat of Storyton Hall. Book Three Murder in the Secret Garden is out August 2nd is a continuation of a fantastic series that began with Murder in Mystery Suite, a book that transported me away before the first paragraph was complete. A picturesque retreat where books and tea time take precedence and you are supposed to relax and rejuvenate. 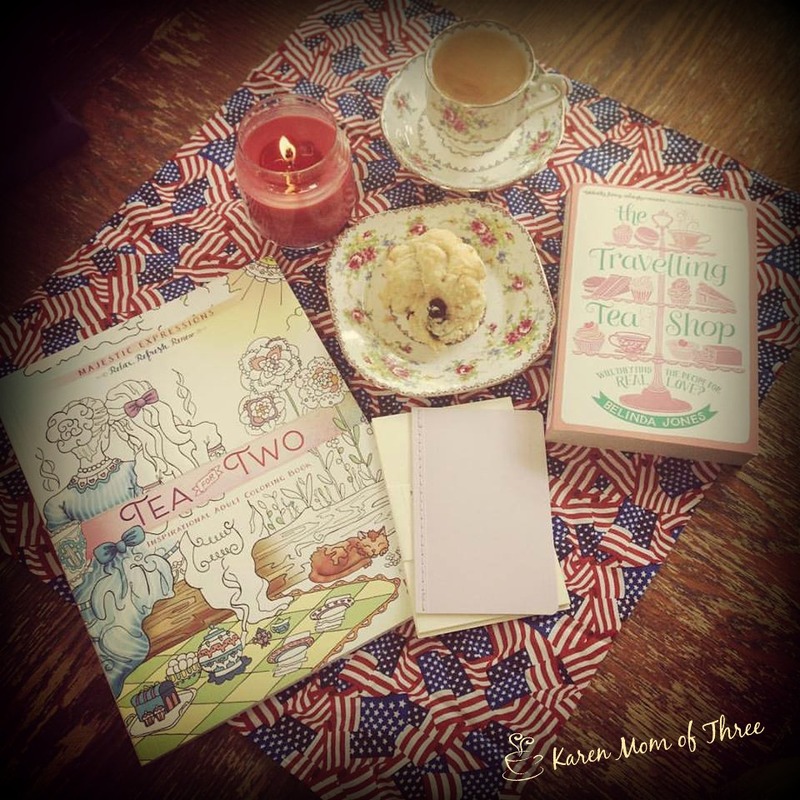 Not everything is ever how it seems and this peaceful book retreat proves to be so much more. 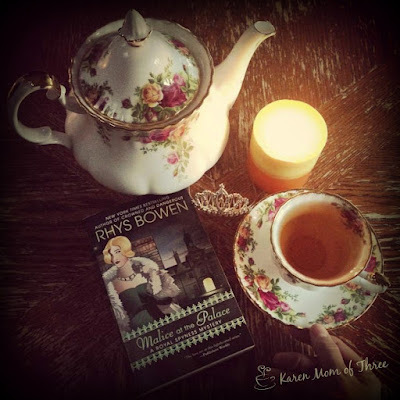 This series is has mystery, intrigue, history, specially trained forces and did I mention the most wonderful afternoon tea? A wonderful cast of characters await you in this series and I loved the new additions in this story as well. 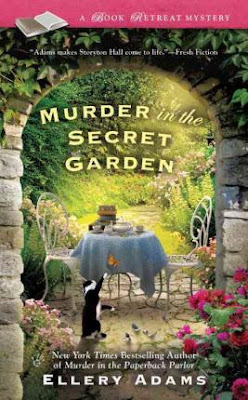 In Murder in the Secret Garden we are treated to a very thoughtful and intricately woven mystery and provocative look at pharmaceuticals, plant lore and herbal medicine. I adored this story and I can not wait for more adventures at Storyton Hall with Jane, the Fins and her twins. 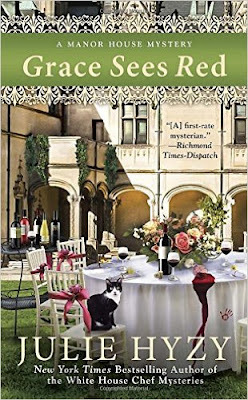 "There is a hidden garden bordering the grounds of Jane Steward s book-themed resort a garden filled with beautiful but deadly plants such as mandrake and nightshade. Tucked away behind ivy-covered walls and accessible only through a single locked door, as described in the pages of Frances Hodges Burnett's classic novel, the garden is of special interest to Jane s current group of guests, The Medieval Herbalists. But when one of them turns up dead, Jane must discover whether a member of the group has come to Storyton Hall to celebrate their passion for plant lore or to implement a particularly cruel means for murder. With thousands of books at her disposal, Jane believes she has the proper materials to solve this deadly problem. If she is wrong, however, she may lose something far more precious than the contents of Storyton s secret library..."
To learn more about Ellery Adams and this series please click here. To order your own copy of Murder in the Secret Garden from Amazon please click here. With free shipping from The Book Depository please click here. Saturday morning has arrived again bringing another opportunity to share this weeks books. I have been thrilled to have been able to read these books this past week and am in awe of the talented authors who's books have spent time with me this week. 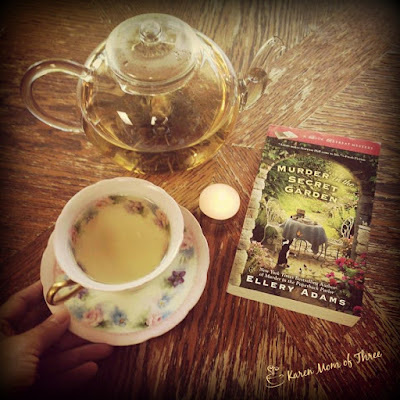 Ellery Adam's Murder in the Secret Garden which is out August 2nd is the third book in the series and just as outstanding as the first. 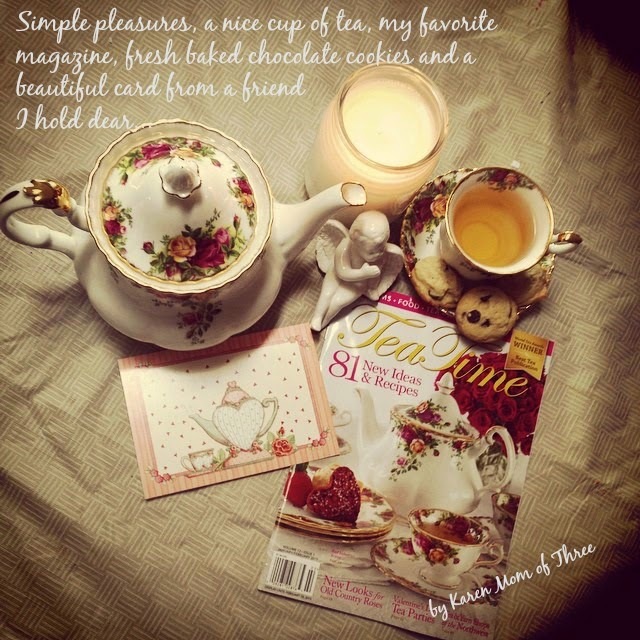 In my cup this week I tried a new to me tea from www,primulatea,com. 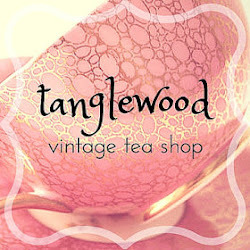 This blooming tea was very refreshing and indulgent to drink this tea all by myself. 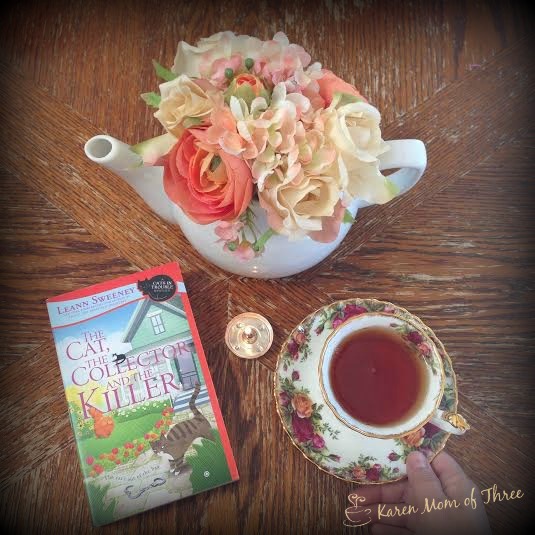 Leann Sweeney writes a wonderful mystery in The Cat, The Collector and the Killer. I know many of you are fans and you will not be disappointed with this one! 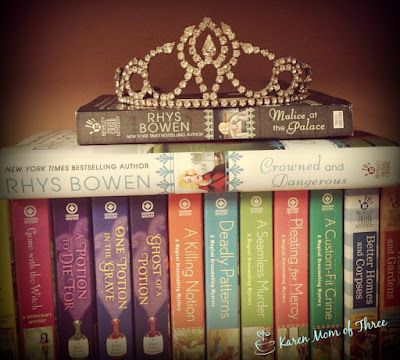 To have had Rhys Bowen's books Malice at the Palace and Crowned and Dangerous this week on my table and now in my heart was such a treat. Books 9 and 10 flow wonderfully together and I was left with a feeling of comfort and excitement in the end. Victor Cantano's Tail & Trouble was a nice change of pace on my table this week, main characters are both male, one human one dog, very good read! 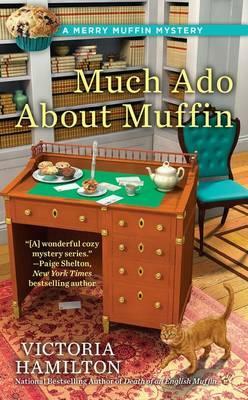 Victoria Hamilton's Much Ado About Muffin was a fantastic way to start the week and I highly recommend this series. It follows life's ups and downs and is a very easy series to fall in love with. 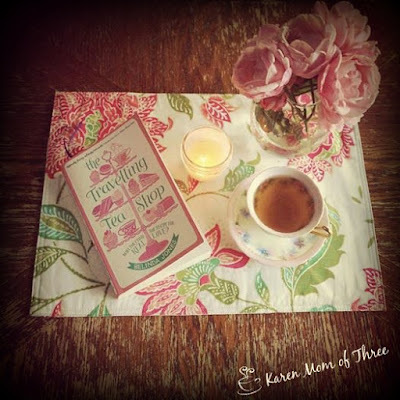 Such a treat to have you join me today for this weeks a cup of tea and a week in review. 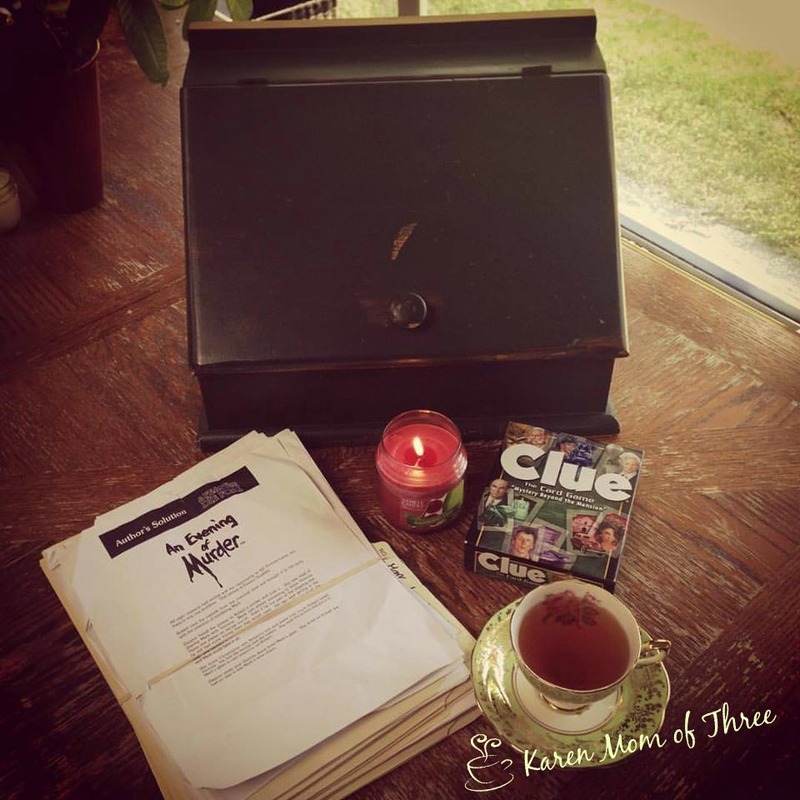 I can not wait to share more cozy mystery crafts and reviews with you again soon. A few weeks back I bought an oversized wooden bread box at a yard sale for $7. It was a wonderful find. 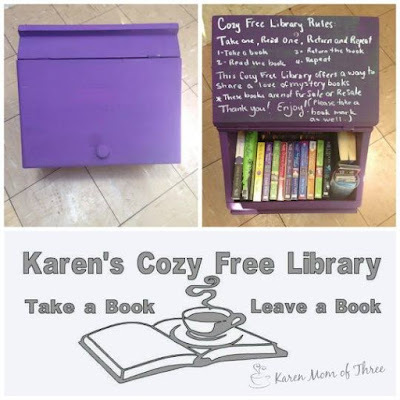 I did not buy it for bread, when I saw it is screamed "Tiny Library" to me and the cozy free library was born. 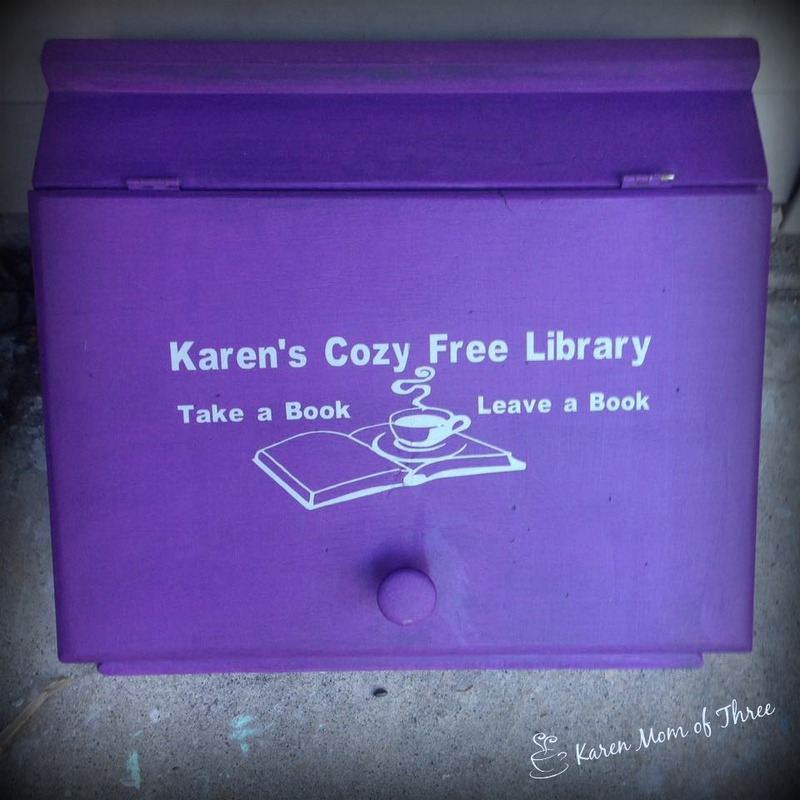 I snapped it up on that wet rainy Saturday morning and with a coat of paint and a vinyl sign my own cozy free Library came to be. I live on the Wet West Coast of Canada and we rent our home, so as much as I would love a larger more permanent water tight free library, I knew this rustic and weathered bread box had everything I needed and was looking for! My sister in law and I went out and bought a purple chalkboard paint and I quickly set to work painting it inside and out. Once it was dry I used a chalk marker and wrote the "rules" of my tiny library and then filled it with some of the years best mysteries I happen to have had on hand. I have a friend in the USA who has an Stornvy shop where she makes vinyl letters and signs and I asked her to help me create the sign for the front of my box. I love what she came up with and almost a week and a half later the sign I ordered in grey arrived. It was easy to put on the front of the box and I added a clear top coat and placed the box at my door. I also let my neighbors in our neighborhood Facebook group know about the cozy free library below my mail box and my front door. I am pleased to say I have had a few patrons pop over and help themselves! I also added bookmarks from some of my favorite authors to the box for my library guests as well. 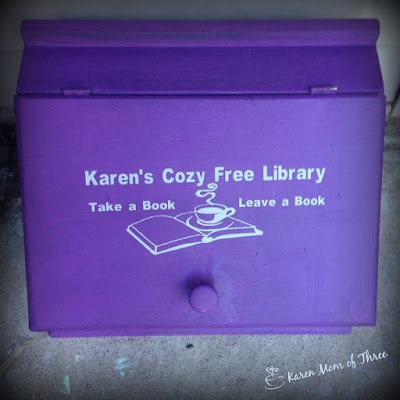 I am very pleased with how this cozy free library has turned out and I hope it inspires others to start their own. 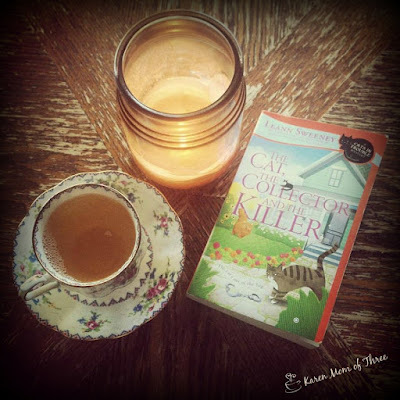 Tuesday I finished reading The Cat, The Collector and the Killer by Leann Sweeney. 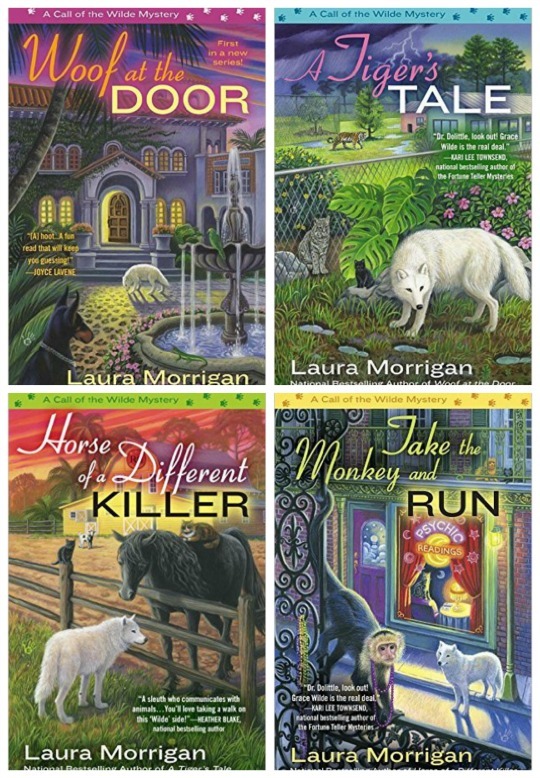 Book 8 in the Cats in Trouble Mystery series hooked me from page one! I have not read every book in this series and it was really easy to understand who everyone was and their relationships. I felt a kinship already to main character Jillian and her clowder of cats! I love the way Leann writes you can tell she is a true cat person and it shows in the way she describes each cat and kitten. The mystery is compelling and intertwined nicely. I felt engaged in the story and a part of the team! 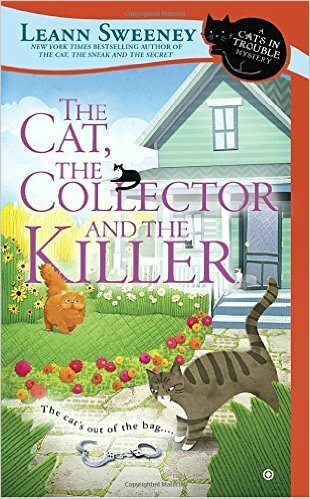 Readers and fans of this series are going to be delighted with Leann Sweeney and The Cat, The Collector, and the Killer! Jillian Hart and police chief Tom Stewart are enjoying peaceful, newly wedded bliss in Mercy, South Carolina, until a woman is found wandering the streets one night. She's in her night clothes, disoriented, and carrying a kitten in a tote bag. A search of the woman’s house reveals many more cats, a maze of cardboard boxes—and a dead man. Although the evidence suggests the frail woman is the killer, Jillian doesn’t believe she’s capable of such a crime. The dead man had many enemies in town, which means finding the real murderer may prove to be its own cat and mouse game.. The Cat, The Collector and the Killer is out August 2nd! Rhys Bowen's Crowned And Dangerous Book 10 Is Truly A Crowning Glory! Sunday I was whisked away to Ireland in December for mystery and adventure. 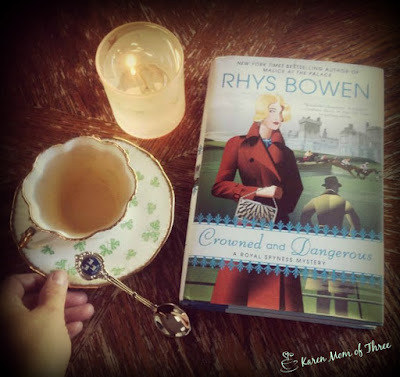 I was absolutely thrilled to learn that Crowned and Dangerous by Rhys Bowen picks up exactly where Malice at the Palace leaves off. 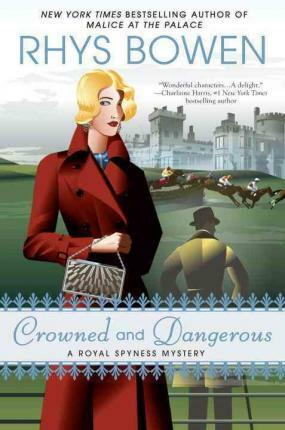 I started reading Crowned and Dangerous about an hour after finishing Malice at the Palace. There is something in the way that Rhys Bowen writes this series that delights and excites me. Rhys Bowen's A Royal Spyness Mystery has the ability to transport me back in time and easily picturing the exciting adventures of Lady Georgiana, and the misadventures of her lady's maid Queenie. I did not know what I was in for with book 10 of this series and it was oh so much better then I could have imagined. I really enjoyed how much of Crowned and Dangerous centered around Georgie and her intended Darcy O'Mara, I was completely swept away! Nothing is simple when you re thirty-fifth in line for the British crown, least of all marriage. But with love on their side, and plans to elope, Lady Georgiana Rannoch and her beau Darcy O Mara hope to bypass a few royal rules... With Darcy driving me out of London in a borrowed motor car, I soon discover that he isn t planning to introduce me to the pleasures of sinning in secret as I had hoped but to make me his wife! Of course, there are some quibbles to be dealt with, such as my needing special permission from the King to marry a Roman Catholic and the question of where we might live after the honeymoon. Though he will inherit a title, Darcy is as broke as I am. Even his family s Irish castle has been sold to a rich American who now employes Darcy s father as a hired hand. Throwing these cares to the wind, nothing could deter us from our mission except perhaps the news that my future father-in-law has just been arrested. It seems the rich American was murdered and Darcy s father had more than enough motive to do the deed. With the elopement postponed, we head for Ireland where he insists he s innocent, and it s up to us to prove it for better or worse." Readers will be delighted with Rhys Bowen's Crowned and Dangerous. Click here to learn more about Rhys Bowen and this series. Malice At The Palace Captivating Mystery, Royally Indulgent Cozy Mystery! 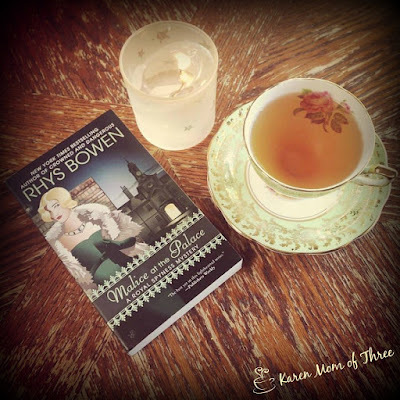 I was so delighted to receive Rhys Bowen's Malice at the Palace to read and review. 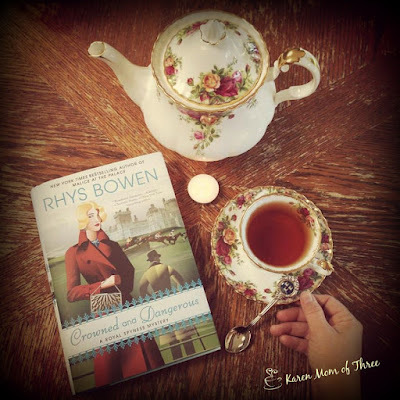 There is something so exciting in the way that Rhys Bowen writes Georgie (Lady Georgiana Eannoch). I am normally not a fan of historical cozies but this one deserves a special place on my cozy shelf. I have read every Royal Spyness Mystery and devoured them as one would a bag of "crisps". These are such a great guilty pleasure read for me and Malace at the Palace was royally delightful. Their was romance, there was intrigue, there was pageantry, there were ghosts and a really risque mystery. This book is set during the depression, and showcases how resourceful Georgie is and has had to become. Royal titles don't always come with the money when you are so far away from the succession of the throne. Oh and then there is Darcy....I could not put this book down, from page one to the end this mystery enveloped me and took me back in time. This is a fantastic series and a wonderful cozy mystery to read with a cup of tea and a few hours to kill. Lady Georgiana Rannoch won t deny that being thirty-fifth in line for the British throne has its advantages. Unfortunately, money isn t one of them. And sometimes making ends meet requires her to investigate a little royal wrongdoing. While my beau Darcy is off on a mysterious mission, I am once again caught between my high birth and empty purse. I am therefore relieved to receive a new assignment from the Queen especially one that includes lodging. The King s youngest son, George, is to wed Princess Marina of Greece, and I shall be her companion at the supposedly haunted Kensington Palace. My duties are simple: help Marina acclimate to English life, show her the best of London and, above all, dispel any rumors about George s libertine history. Perhaps that last bit isn t so simple. George is known for his many affairs with women as well as men including the great songwriter Noel Coward. But things truly get complicated when I search the Palace for a supposed ghost only to encounter an actual dead person: a society beauty said to have been one of Prince George s mistresses. Nothing spoils a royal wedding more than murder, and the Queen wants the whole matter hushed. But as the investigation unfolds and Darcy, as always, turns up in the most unlikely of places the investigation brings us precariously close to the prince himself." I absolutely love the cover of the books in this series and they so accurately depict and set the scene for each book. I am so enchanted by this series and I hope you will be too. 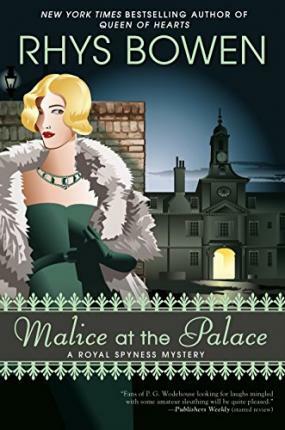 The paper back copy of Malice at The Palace comes out August 2nd. You can order your own copy here from The Book Depository (with free shipping always) by clicking here. Saturday night I finished Much Ado About Muffin. I so enjoyed it. 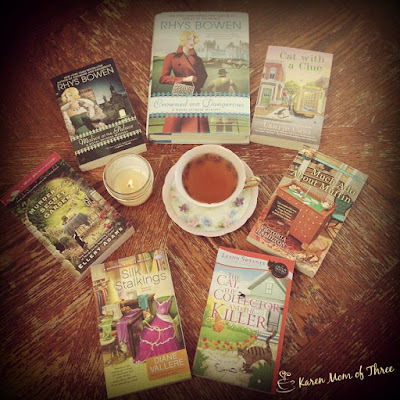 This wonderful series is written by author Victoria Hamilton and has quickly become a favorite series of mine. 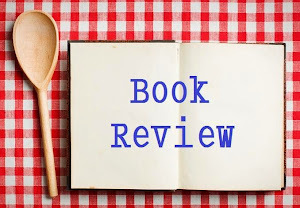 Main character Merry has so many qualities that I admire and it has been such a pleasure to read about her journey of self discovery and the friendships she has made along the way. Merry inherited the Wynter Castle in Autumn Vale New York in book one and in Much Ado About Muffin we the struggle continues as to how she will keep and maintain this amazing gift. The theme of this series is about resiliency, family and the people you choose to surround yourself with. How they help you, how they hurt you and how you learn to grow from each experience. I really enjoy this series because I feel like the struggle is real for the main character Merry and that as she deals with each situation in the series she grows leaps and bounds. From book one to book four she goes through metamorphosis in a away that feels natural and very gritty and real. Along the way as she tries to find herself she also happens to find her self tangled up in mysteries. Unexpected friendships and fantastically developed characters await you in this series and some truly delightful recipes too! 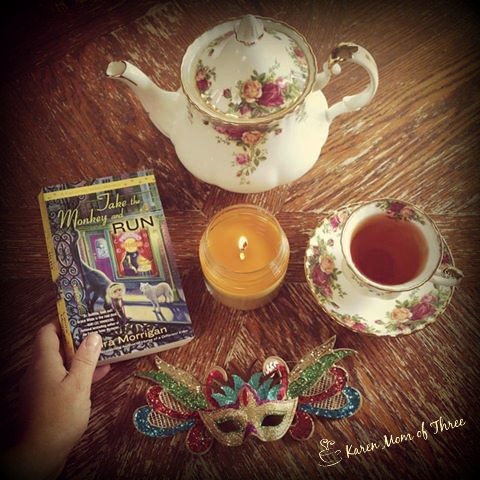 Much Ado About Muffin is a great read and is one of my most favorite books so far this summer. I think the cover is also outstanding! So much to see, I feel like each time I look at it I find something else that completely fits the story! In this fresh mystery from the national bestselling author of "Death of an English Muffin," baker Merry Wynter comes to the aid of an innocent woman accused of murder. When muffin baker Merry Wynter sees an innocent woman accused of murder, it s dough or die... Opera singer Roma Toscano may have a crippling case of stage fright, but she certainly is stirring up drama in Autumn Vale, New York, as she prepares for an upcoming performance at Merry s Wynter Castle. With her flamboyant style and flirtatious personality, Roma attracts fans as well as critics, including the town s postmistress and Merry s bitter foe Minnie Urqhart. But Roma and Minnie s heated rivalry goes cold after Merry discovers Minnie dead at the post office. While every clue seems to be another ingredient in the investigation of Roma, Merry thinks the case is half-baked, and she s eager to get her mitts on the real killer..."
To learn more about Victoria Hamilton please click here. 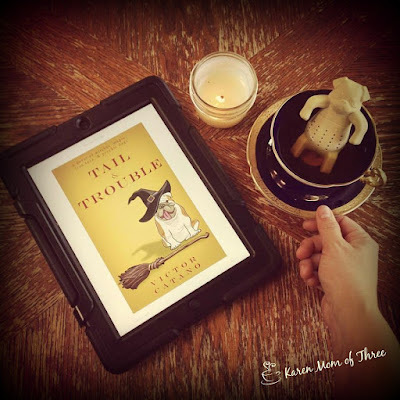 Last week I was sent Tail & Trouble by Victor Cantano to read and review. 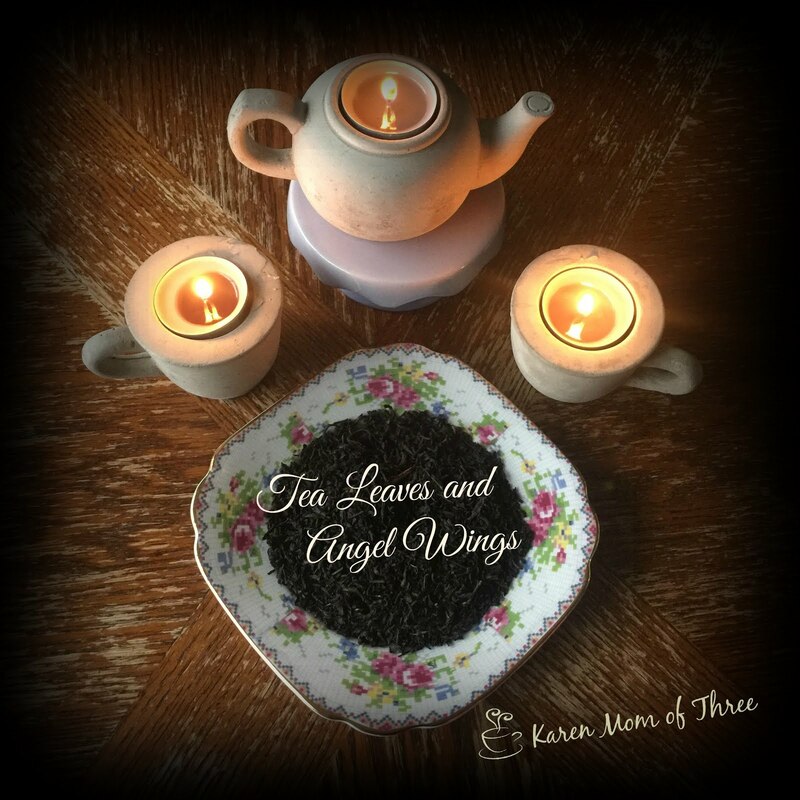 I was delighted to be asked and as I love a good Witch mystery I quickly accepted. This novel is a mystery and while not a traditional cozy it had a lot of great cozy elements. This was a good mystery and a good story. The relationship between the Dog Oscar and main character Gabriel was strong and brilliantly executed. The devotion of the characters to finding Sheila (Gabriel's girlfriend and Dog Oscar's Mama) was admirable and endearing. While this novel was a bit rougher then a cozy I enjoyed it very much and I love the cover don't you? When Gabriel’s witch girlfriend doesn’t return from her latest trip, he gets on the road and heads out to find her. Sheila's coven is secretive and distrustful of Gabriel, so the only help he has is Sheila's familiar, a bulldog named Orson, who is psychically linked to both of them. In Florida, they walk right into an elaborate plan to steal Orson. A mysterious wizard named Yareth is behind the plot, and he may also know where Sheila is. Gabriel and Orson will have to fight for their lives as they navigate around all the magical roadblocks to force Yareth’s hand. They won’t give up until Sheila is safe. 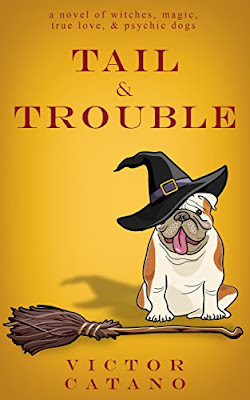 To order your own copy of Tail & Trouble please click here. Saturday morning and my table is full of wonderful August reads. 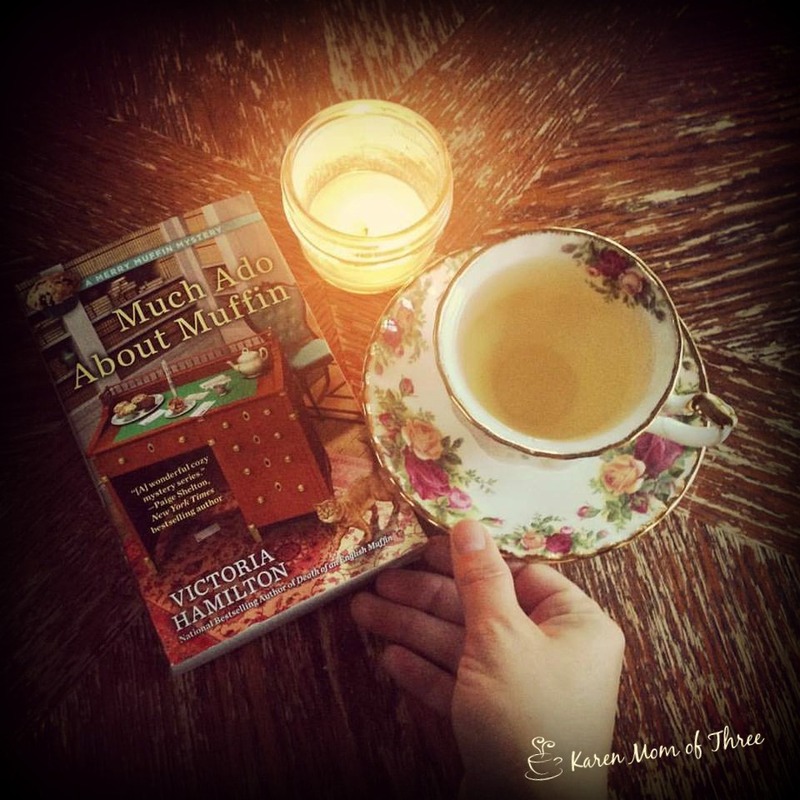 I am currently reading Much Ado About Muffin by Victoria Hamilton. Yesterday my table received some wonderful new releases for August and I quickly dove right in. So hard to know what to choose some favorite series here on the table! 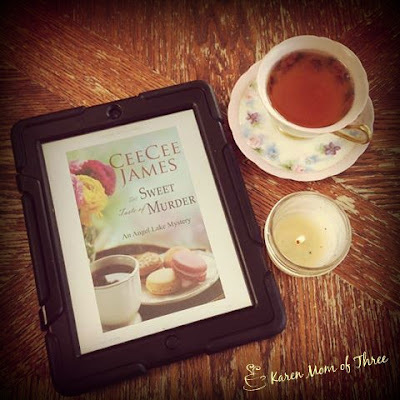 New to my Kindle Thursday was CeeCee James The Sweet Taste of Murder, I am looking forward to reading this one and I love the cover art! I have been so delighted to have such wonderful books on my table this week that I read. 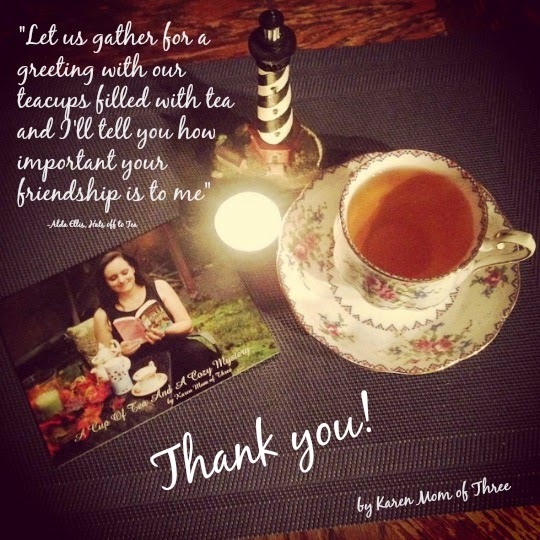 The Traveling Tea Shop by Belinda Jones was absolutely fantastic. 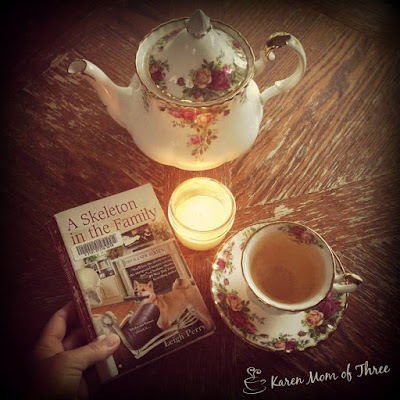 A Skelton in the Family was a surprising and fun read. Leigh Perry has three books in this series and I look forward to reading the other two soon. 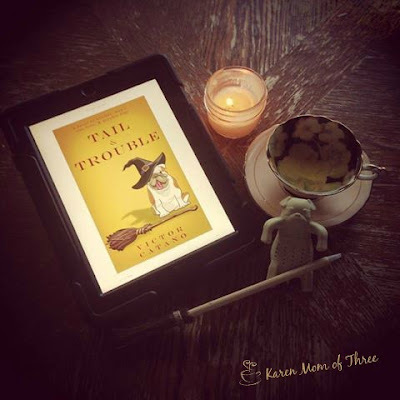 Also on my table yet Tail & Trouble by Victor Catano I do love a Witchcraft Mystery! 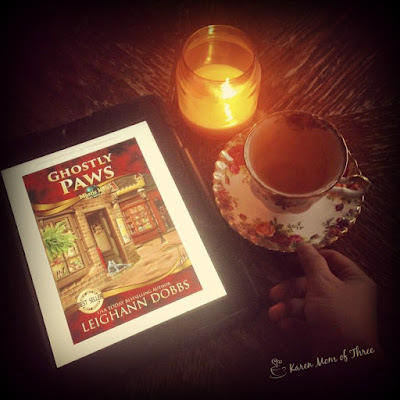 Ghostly Paws by Leighann Dobbs was another first in series I enjoyed this week. 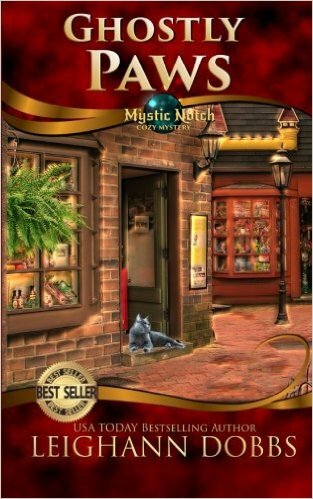 A great story with magical cats and more mystery to come. 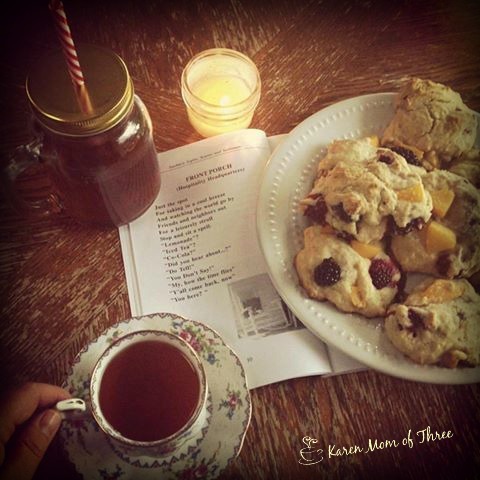 I have been in a peach mood this week and made some blackberry peach scones which I paired with a poem by Patricia Neely-Dorsey. Click here for the recipe. This paired nicely with my peach black tea as well. 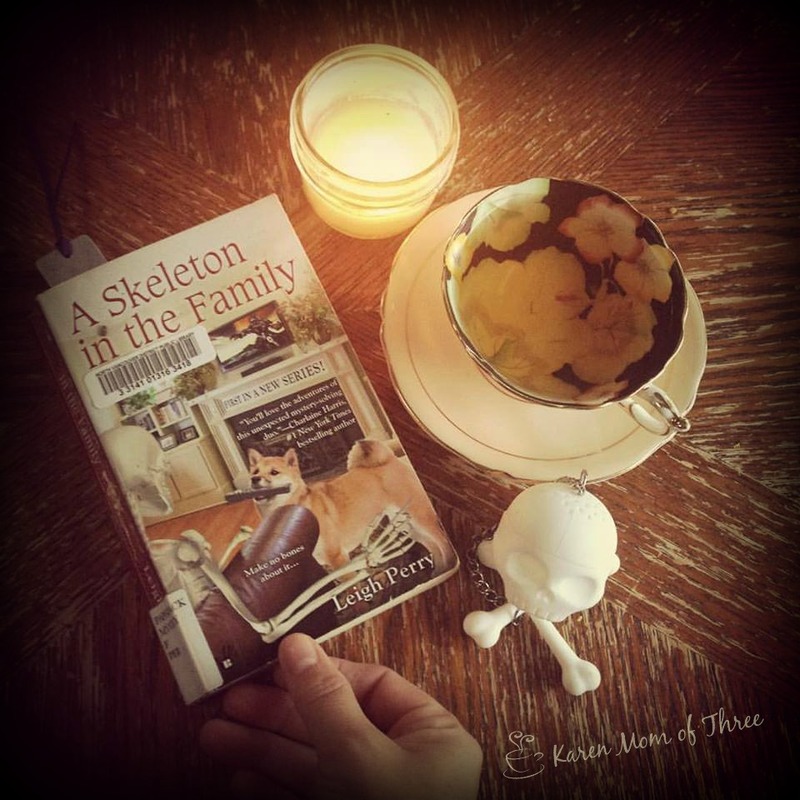 A Skeleton In The Family by Leigh Perry Was Fantastic! Wednesday afternoon I finished A Skeleton in the Family by Leigh Perry. This was a book suggested to me by my friend Karen and suggested during the #saveourcozies read-a-long. I could not find it in store near me but my wonderful library had it and I could not wait to read it. I was THRILLED with it, as much as it is a cozy paranormal mystery it really did not feel paranormal if that makes sense. It was so well written and oddly plausible in a pleasing way. I quickly fell into step with story and loved every minute of it. It was funny, it was sad and it was endearing and it was wonderful. Great story, great characters and lots of heart. I was so sad to learn this series has been canceled and I truly hope that author Leigh Perry finds away to bring Sid to a new publisher or self publishes this series. Most families have skeletons in their closets Moving back into her parents house with her teenage daughter had not been Georgia Thackery s Plan A. But when she got a job at the local college, it seemed the sensible thing to do. So she settled in and began reconnecting with old friends. Including Sid. Sid is the Thackery family s skeleton. He s lived in the house as long as Georgia can remember, although no one, including Sid, knows exactly where he came from and how he came to be a skeleton. Sid walks, he talks, he makes bad jokes, he tries to keep Georgia s dog from considering him a snack. And he manages to persuade Georgia to let him leave the house. But when she takes him to an anime convention disguised as a skeleton, of course he sees a woman who triggers memories of his past. Now he is determined to find out how he died with Georgia s help. But their investigation may uncover a killer who s still alive and well and bad to the bone FIRST IN A NEW MYSTERY SERIES!" I love the cover art on this book and am now placing this series on the top of my wish list. I loved the theme of the book, the characters, setting, relationships and so much more. Wonderful read and one I am so glad was suggested to me. 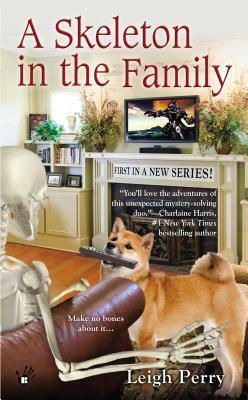 To order your own copy of A Skeleton in the family please click here. 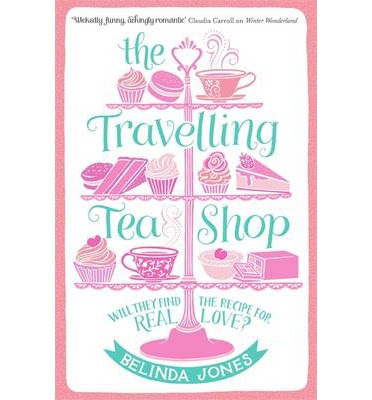 Sunday night I started The Travelling Tea Shop by Belinda Jones. I was so thrilled to get this book for a book swap I did in June and it was such a lovely read. Very cozy and lightly romantic with "a touch of mystery" adventure. This book was like a breath of fresh air and a calming coastal delicious retreat. I was so moved by the characters, their stories and how they came together. The food and history that was beautifully presented and easy to imagine with the way Belinda writes. I delighted in picturing myself traveling with this somewhat unlikely crew at the beginning of the book and felt like they were all family at the end of the trip. This was a very cozy, very calming and truly delightful read. The cover perfectly matched my Monday morning tea and set the tone for the week nicely. 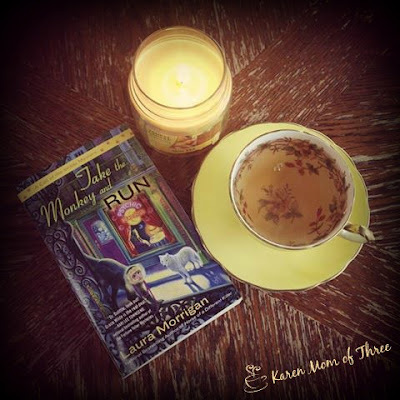 A Cup of Tea With Laura Morrigan Author of Take The Monkey And Run! Today I am so happy to have Laura Morrigan here for a cup of tea and a chat about her new book Take The Monkey and Run (Which I loved!) and her Call of The Wilde Series. KMOT: Thank you Laura for joining us today. While writing what sustains you? Coffee, Tea, other? LM: "Coffee!!! Along with the kindness of friends and family who periodically throw food in my direction." 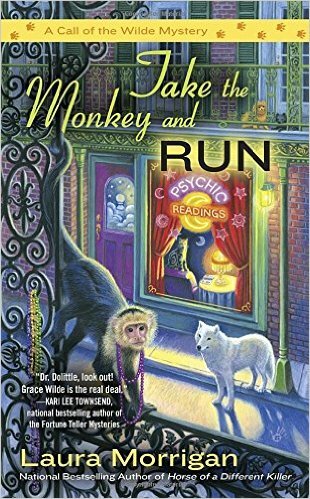 KMOT: How long was the writing process for Take The Monkey and Run? LM: "Longer than usual because of some major life changes. Divorce, moving etc... (No sad faces- everyone is happy now!) so it took me about a year, vs the typical nine months." KMOT: Take the Monkey and Run is based in New Orleans did you take a field trip there for research? LM: "I sure did! I know, tough life, right? Research was fun, of course! But it really does help feed ideas. " KMOT: Main Character Grace has such a unique talent, is she based on anyone you have ever met? LM: "Nope. Like many people with pets, I've always wondered what they were thinking. Which made me wonder what it would be like to actually know. From that, Grace was born." 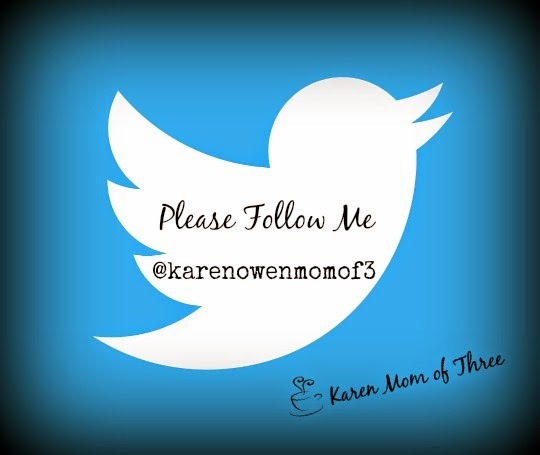 KMOT: Is there anything about your series you would like my readers to know? LM: "I tell people that the Call of the Wilde series, while still a cozy, has a bit more suspense and action than most- so be ready for that! Thank you Laura for joining us for a cup of tea today! 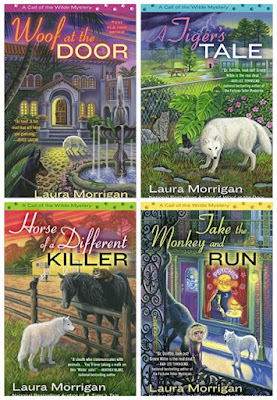 To learn more about Laura Morrigan and her Call of The Wile Series please click here. 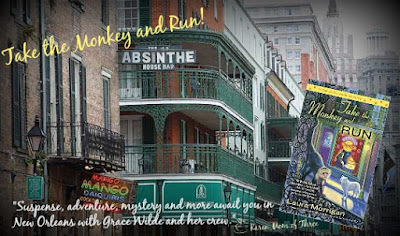 To order your own copy of Take The Monkey and Run with free shipping from The Book Depository please click here. From Amazon please click here. Ghostly Paws By Leighann Dobbs Was A Ghostly Great Read! I finished Ghostly Paws by Leighann Dobbs on Saturday night. There was so much to love about this first in series. The setting, the mystery and all the cats! I truly enjoyed that main character Willa was north of 40 and that her friend Pepper had a tea shop, and stopped by with tea. I could easily picture their relationship and felt like a friend on the couch visiting with them. There were some truly funny moments in this cozy as well as endearing. The mystery was a good one and I did not have it figured out until the murder was revealed. I think the name of the town Mystic Notch was a brilliant choice and the feral cat colony a lovely spin! I am so happy to have found and bought Ghostly Paws to read and review. I also love the cover! *Spoiler alert the ability to see the green mist was truly an exciting part of this book and I hope series in the books to come! To order your own copy like I did from Amazon please click here. 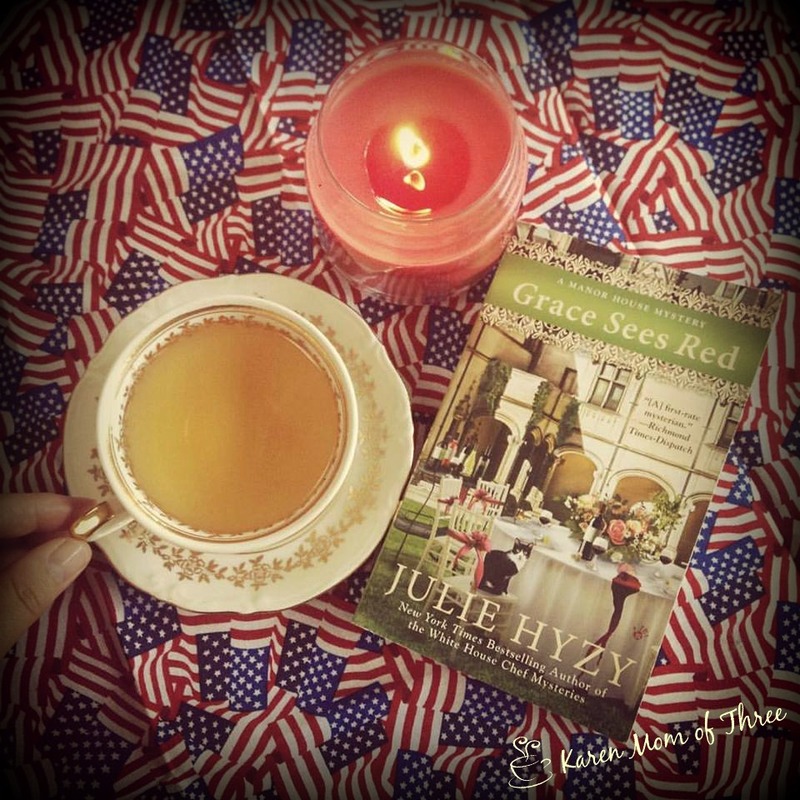 Grace Sees Red by Julie Hyzy came out earlier this month and spent the day with me on July 4th. This is a series I was not familiar with and I was surprised to learn that this series is with this mystery 7 books in! Lots of very interesting and complicated relationships in this book, Main character grace and her Uncle end up trying to assist Grace's assistant when she becomes implicated in a murder in one of the most unlikely places. 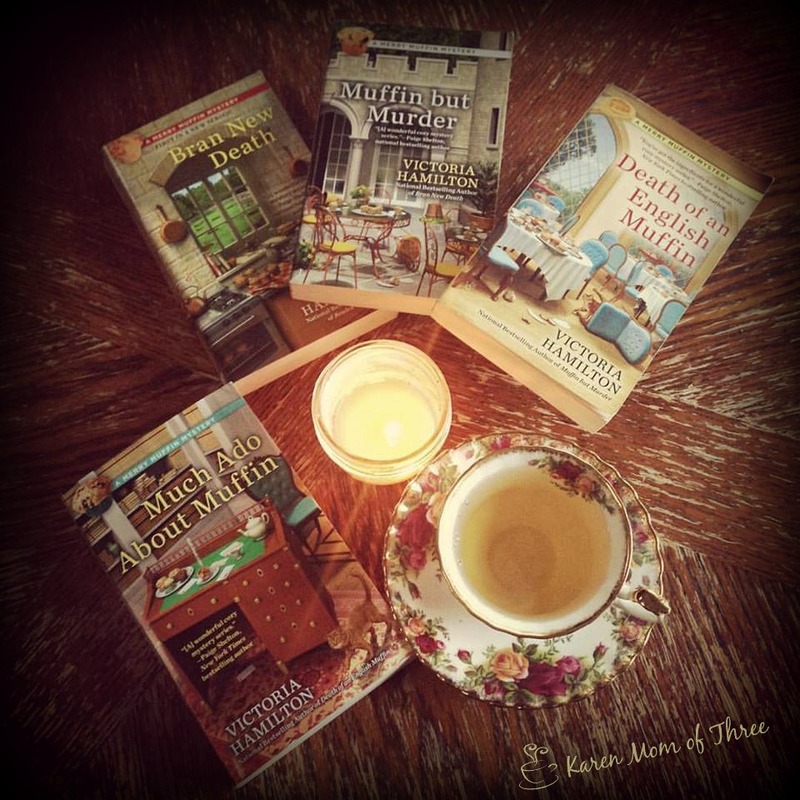 Fans of the series are sure to enjoy this Manor House Mystery! Check out Julie Hyzy Grace Sees Red on Amazon by clicking here. 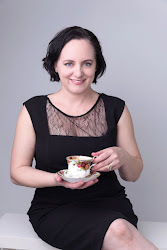 Learn more about author Julie Hyzy by clicking here.